High-rez photos and video from Specialized’s Turbo launch are lightboxed on G+ and Flickr with video on YouTube. As posted earlier today, we weren’t at the launch, but got a call from Valencia with a quick debriefing. If you’ve followed us for long, you know this is the type of e-bike we’ve been insisting on for years. Cyclelicious, Bicycle Design are discussing the Turbo and see Geir Anders Ørslien’s post first ride report. Oversized alloy fork with tapered 1-1/8” to 1-1/2” steerer and Q15 thru-axle dropout is strong and responsive—even at 45kph. 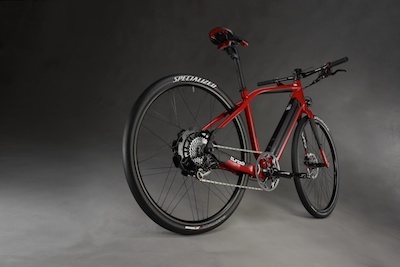 Importantly, this bike doesn’t license the Bionix system and was designed entirely by Specialized. From the photos, it looks like it’s a Sirrus with the battery in the down tube and also a motorized drivetrain. That’s instead of a hub that either pushes or pulls you around. Here’s a video with Marc Faude from Specialized. and as soon as the team that worked on this is rested from the launch, I expect to have more data and I hope a test ride. Previous Previous post: Where Tommeke Gets his Strength! Next Next post: So I Yelled, Fawk All Y’alls!